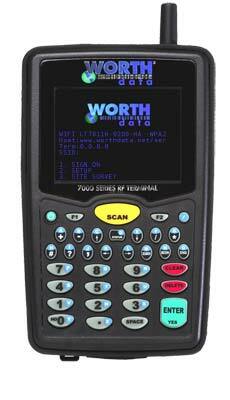 The 7802 RF Terminals are wireless radio frequency mobile bar code scanning terminals with a 802.11 Wi-Fi radio. 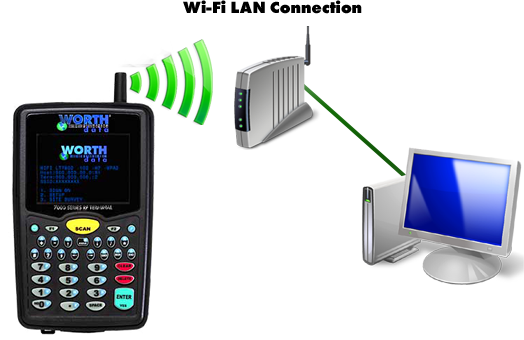 If you are already wired for 802.11 Wi-Fi, then this is the Mobile Terminal for you! There are several models available with a your choice of bar code scanners, either a 1D laser scanner or a 2D imaging scanner integrated right into the top of the unit. There are also models featuring Bluetooth wireless technology for mobile printing and communication. 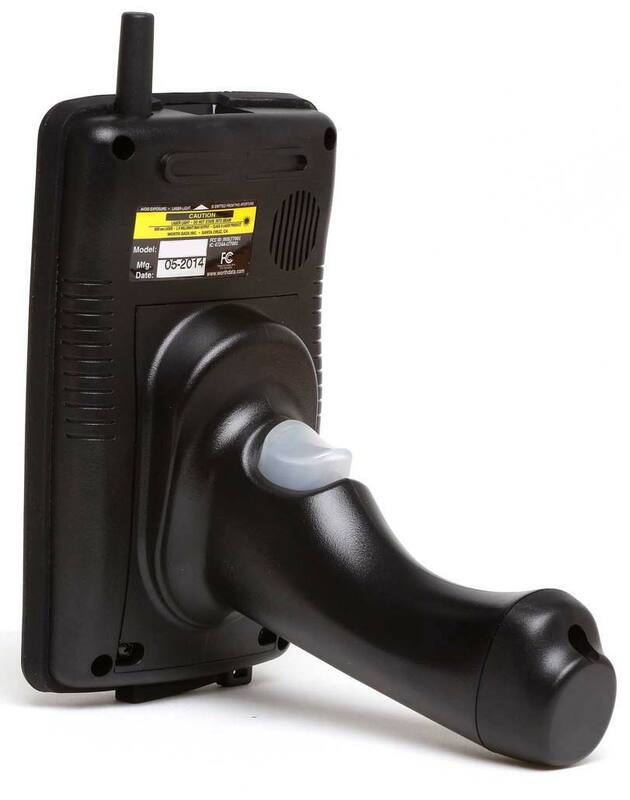 Our most popular units have the integrated ergonomic gun handle installed which makes it easy to do one handed scanning, plus there is second Li-ion battery in the handle to double the battery life. Since a host program, written in any language, can control the Terminals in real time, programming time and costs are significantly less than with competitive terminals. 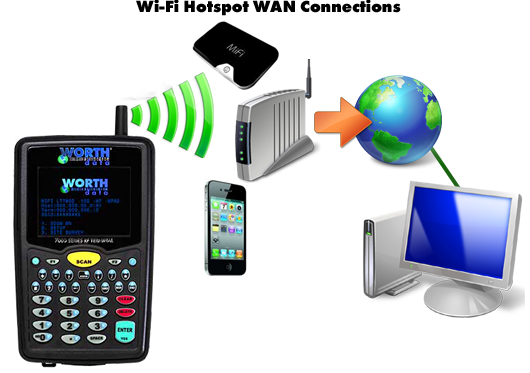 Compatible with Cellular or MiFi mobile HotSpots! 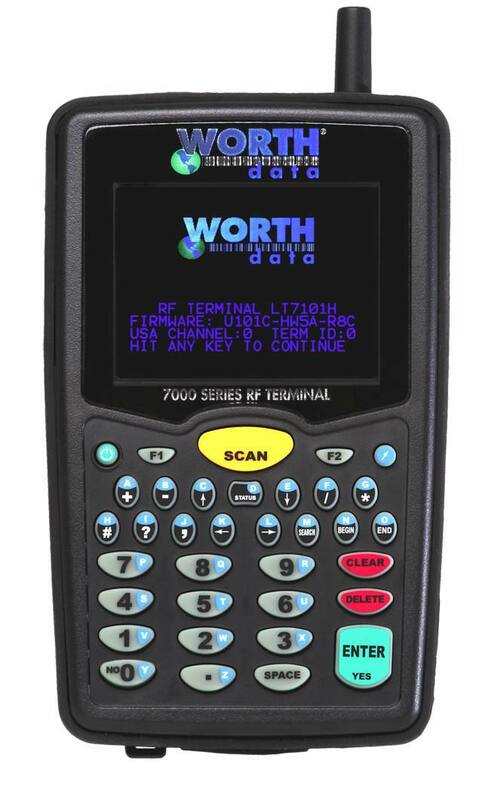 The 7000 Series Terminals haves been designed with the ergonomics of the user in mind starting with a high visibility 15 Line TFT Color QVGA LCD Display and a keypad layout that has been designed to make scanning and keying easier. The small size and weight of the unit, along with the curved shape, make it very easy to hold and scan for long periods of time. Our H7000 handle makes scanning even easier for long term use and was one of our most requested features. The handle is sold standard on the unit when you purchase a LT78x2H or LT78x2B - or you can add it to your terminals at a later date if you want to by ordering the H7000 unit. The 7802 WiFi RF Terminals are manufactured right in our California facility, and since we do all of own engineering, software development, product design, testing, and assembly we can control every aspect of the quality and features, providing you with a finished product that is simply the best available. The LT7802 Terminals come with a high speed 1D bar code laser reader built into the top of the unit. 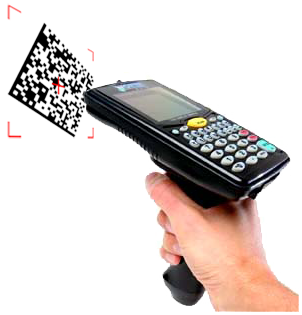 When you press the scan button, or the trigger on the handle, a laser beam scans at 100 times per second to pick up even poorly printed or damaged bar codes easily. The unit can also scan very high density codes with narrow bars as small as 2.5mil .0025" (0.064mm) - equivalent to 23cpi Code 39! Standard 1D bar code types supported include UPC/EAN, UCC-EAN-128, Code 39, Full ASCII Code 39, Code 128, GS1-128, ITF-14, GTIN, Codabar, MSI Plessey, GS1 DataBar (RSS-14) omni and stacked variants, ITF Interleaved 2 of 5, Standard 2 of 5, Bookland EAN, Code 11, LabelCode4, LabelCode5, Storage Tek, and Code 93. The reader auto discriminates automatically. Below is the chart of the typical range of reading. A 6 mil barcode is considered high density, the 10mil and 14mil are typical general purpose medium density, and the 40 mil and 100 mil are large low density codes. The LT7822 Terminals come with a 2D imaging bar code reader built into the top of the unit. 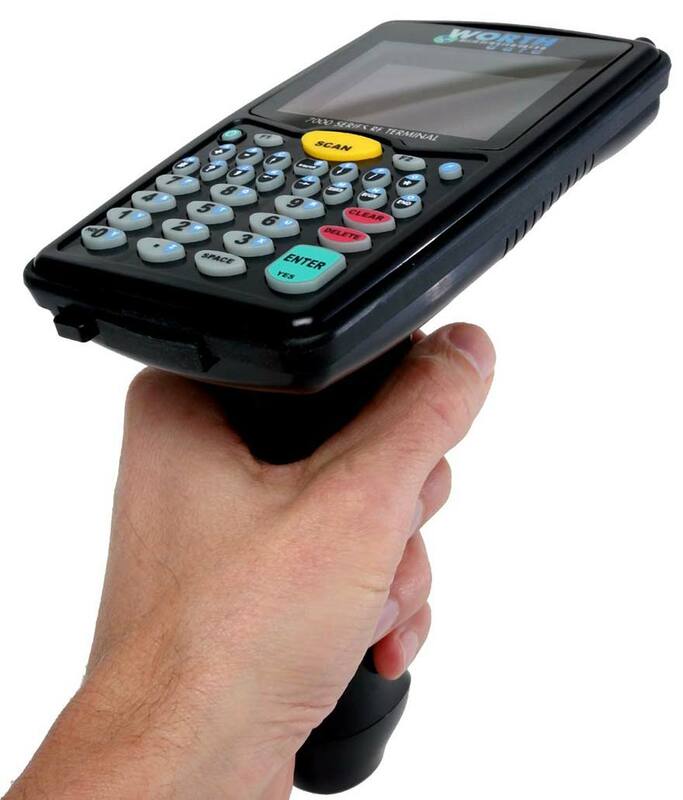 When you press the scan button, or the trigger on the handle, a laser aiming assist dot and an imaging beam allow you to omni directionally scan both standard 1D barcodes as well as 2D matrix bar codes easily. The unit can also scan very high density codes with narrow bars as small as 2.5mil .0025" (0.064mm) - equivalent to 23cpi Code 39! Bar code types supported include PDF417, MicroPDF417, Datamatrix, MaxiCode, QR Code, Aztec, Postnet, USPS Intelligent Mail IMBC, UPC/EAN, UCC-EAN-128, Code 39, Full ASCII Code 39, Code 128, GS1-128, ITF-14, GTIN, Codabar, MSI Plessey, GS1 DataBar (RSS-14) omni and stacked variants, ITF Interleaved 2 of 5, Standard 2 of 5, Bookland EAN, Code 11, LabelCode4, LabelCode5, Storage Tek, and Code 93, plus many others. The reader auto discriminates automatically. All terminals come with a industry standard NP-120 Li-ion battery in the unit which has a capacity of 1950mAh. In the event of failure this battery is field replaceable - via 2 screws on the door or handle. With our advanced battery charging you can have a full charge in 2-3 hours or less! Intelligent charging replenishes only the power used - no need to fully discharge batteries or wait through a full charging cycle for partially used batteries! With the LT7802H Handle unit you will get a second battery included in the handle which will effectively double the battery life of the unit. The F10 power supply and battery(s) are included with each RF Terminal. Despite its small size and weight (LT7802 is less than 10 ounces), this unit has been tested to withstand 5 ft drops to concrete! It also carries a 2 year warranty against defects in workmanship and materials. Each scan and each time you press the Enter key, data is transmitted to an Access Point, then on to the Application Server. The Application Server sends prompts back to the display and can trigger voice message broadcasts on the 7802 Terminal. You can start small, develop your applications, and then expand at a low incremental cost. Unsurpassed performance at the lowest price - a unbeatable value!! For users who have software written for the Worth Data 70/700/802/7000 Series RF Terminals using the PromptCOM / ActiveX component, running your application on the 7802 RF Terminal is as simple as re-compiling your program to talk to the new Application Server. The Windows ActiveX Application Server component is included at no extra charge with every 7802 Terminal - there is no development package to buy! The new Application Server talks exclusively to the 7802 series terminals. It will not work with the older generation 802 RF terminals, however you can add the new ActiveX to your existing software and still use the 802 terminals in the same location as the new 7802 RF Terminals. The 7802 RF Terminal offers flexibility by allowing you to connect to an existing 802.11 wireless LAN network - no additional wiring or equipment is needed. If you are already wired for 802.11 adding Terminals is a breeze! The 7802 has a Wi-Fi 802.11 b/g radio but it can talk to any access point with 802.11 b/g/n support. The 7802 Terminals are configurable to SSID, fixed or DHCP supplied IP Address, 64 bit or 128 bit encryption key, channel, and subnet mask. Support for WEP, WPA®, & WPA2® protocol security is also included. The 7802 RF Terminal offers additional flexibility by allowing you to connect to an existing 802.11 Wide Area Network (WAN) via a wireless hotspot, including Cellular or MiFi devices, to remotely use the RF Terminals. Using our free Web-based Connection Host as the conduit, or talking to your own web server, you can easily use the 7802 Terminals anywhere. Now you are no longer restricted to a existing network or local network. 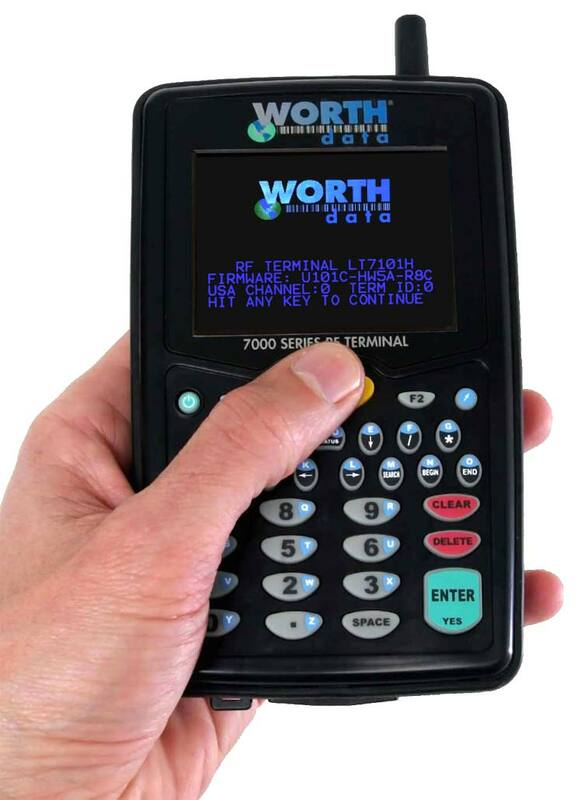 There is no programming required on the terminal. All programming can be controlled by a host computer running the Application Server, in the ActiveX-compatible language of your choice! You can also use a web server based application written in PHP ASP etc.. to control the RF Terminals from your own web site. No development package is necessary to buy. All you need is supplied with the purchase of an 7802 series RF Terminal. It's the perfect product for developers who wish to distribute systems to remote locations. 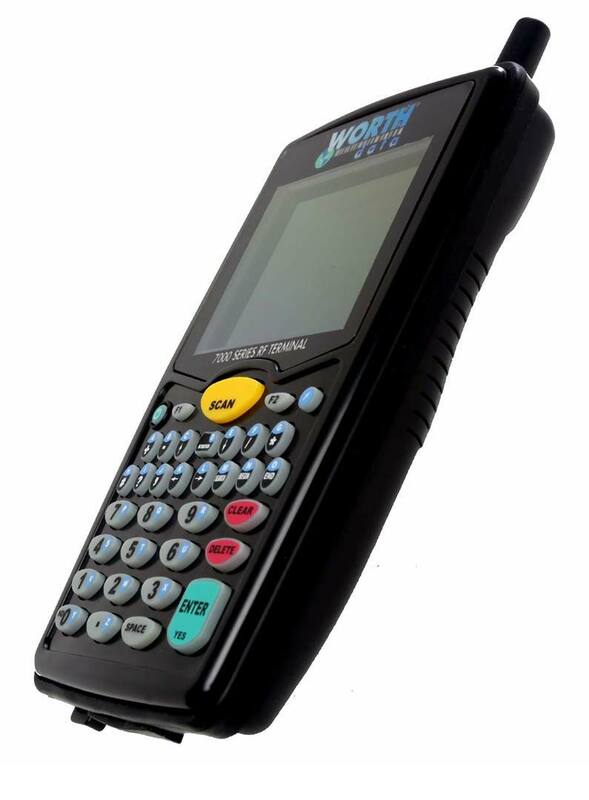 The 7802 RF Terminal includes our KwikCount RF add-in for Excel! This add-in gives you a simple, interactive program development tool using Excel; right out of the box - no programming knowledge needed! If you can use Excel, then you can use KwikCount RF to develop interactive real-time applications which use an Excel data base! Many applications include an import/export feature for Excel - allowing you to export your application's data, use KwikCount RF to update the data base on-line, and then import the updated data back into your application - all with NO programming knowledge required! 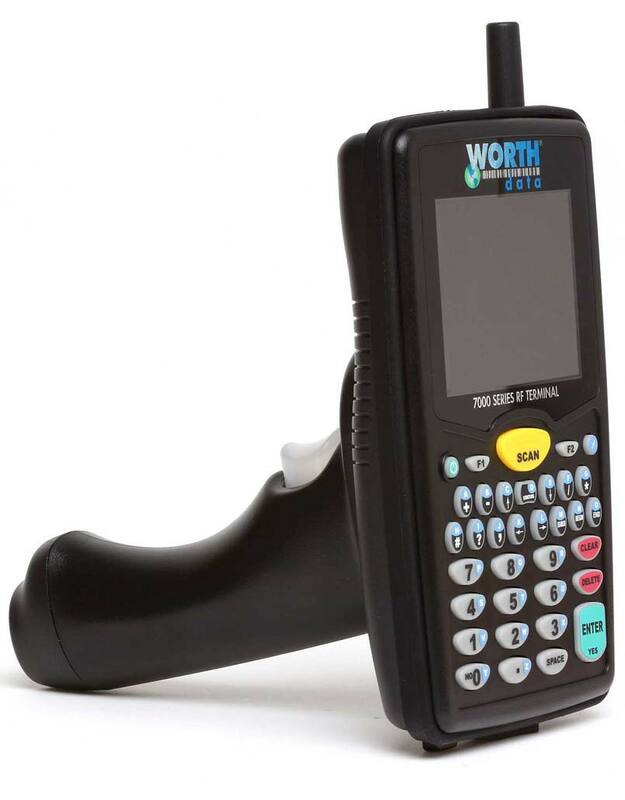 This is perfect for inventory, shipping, receiving and even shelf price verification! Not only can you collect data, but you can display data from the Excel worksheet on the screen of the terminal to help guide the user. In addition, with our new WAN support you can talk to a computer running Excel anywhere in the world and update and display information from that workstation running Excel remotely. Based on our popular KwikCount/EX for the TriCoder, our Kwikcount RF add in gives you a simple inventory application with no programming needed! If you can use Excel, then you can create a real-time inventory or data collection application for your 7802 RF Terminal. KwikCount RF ships for free with every 7802 RF Terminal! Is provided free of charge, providing the overall structure and all routines which when completed, result in a running application. It is compatible with Visual Basic, Visual C++, Delphi, and most other Windows 32 bit development platforms. Click here to download the Manual. Again, there is no programming necessary on the RF Terminal itself. All ActiveX programming is on the Windows-based Application Server and can be in VB, Access, Delphi, etc. The LT78x2B RF Terminals are equipped with Bluetooth wireless technology and are capable of talking to any printer with Bluetooth wireless technology built in, allowing you to easily print product/price labels, barcode labels, receipts or other tags. Communication and printing to any other brand of mobile printers that are equipped with Bluetooth wireless technology is very easy using the special menus built into our 7802 RF Terminals. Using standard RF Terminal programming, the host computer simply sends printer command sequences to the RF Terminal. These printers greatly increase the functionality of the RF Terminal. In addition to the display prompts and error messages, the RF Terminal has the ability to audibly prompt and advise the operator with pre-recorded prompts and error advisories triggered by the host program. Voice messages are particularly helpful in poorly lit areas, cold environments, non-English speaking cultures, and keyless applications (faster scanning without having to refer to the display). The Bluetooth® word mark and logos are registered trademarks owned by Bluetooth SIG, Inc. and any use of such marks by Worth Data is under license. Other trademarks and trade names are those of their respective owners.